Dates and venues for the courses and demos listed will be confirmed upon booking. Further courses and venues will be added to this page as and when they are finalised. If you would like to register on any of the courses listed below, or pre-register your interest in any of the suggested forthcoming courses displayed on the Gallery page, please complete and submit the form on the Enquiries page. If you prefer to have personal training in the comfort of your own home, you can select from any of the courses listed below, or tailor a course to your own requirements. Payment is due at the time of booking to secure your place. Please note that your payment is non-refundable. However, under exceptional circumstances you may be able to transfer your course to an alternative date or topic provided that a minimum of 14 days notice is given and space is available on your alternative choice. We are unable to accept any transfers within 14 days of your course date and are unable to carry out more than one transfer per payment. If for any reason we need to cancel the course we will endeavour to give you as much notice as possible and will offer you a full refund or a place on an alternative course to the same value. The following courses are available during 2013. In most instances, all necessary equipment and materials will be provided for use on the day. You will also be provided with a box to take your creation home. On his course you will be shown two methods of making roses in order to be make realistic displays of wired roses and rosebuds. They may be made in the colour of your choice. 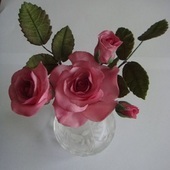 You will also be shown how to make and colour rose leaves . You will learn all the necessary techniques, including colouring and taping so that you go home with a beautiful display. 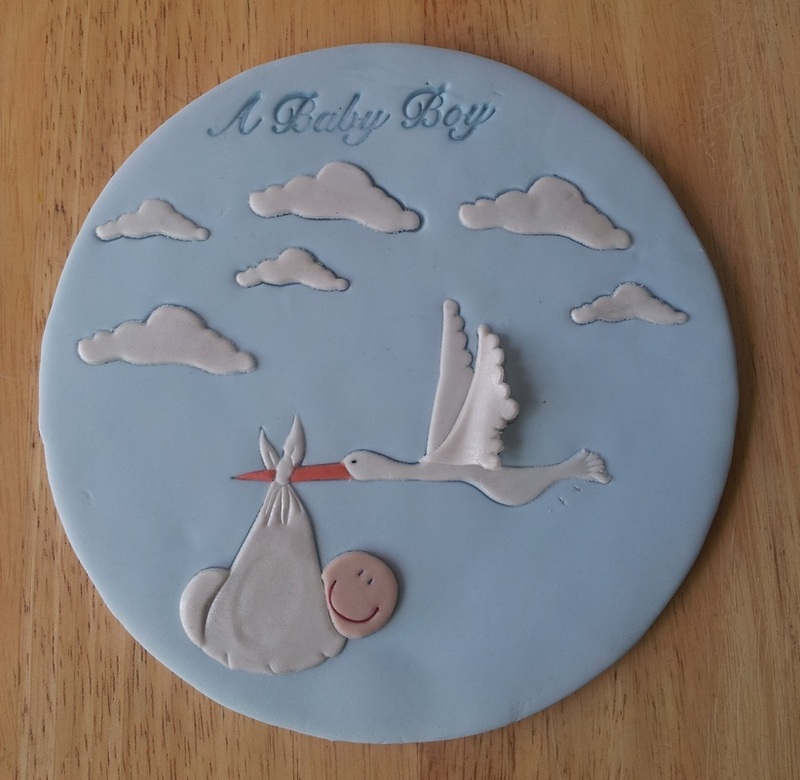 On this course you will learn how to make these two delightful plaques displaying a stork holding a baby for the baby boy plaque and lambs and babies for the baby daughter plaque. You will learn how to cover boards with sugar paste which will then be used as plaque You will emboss the separate designs onto the plaques and will learn various techniques using Patchwork Cutters in order to create these designs. 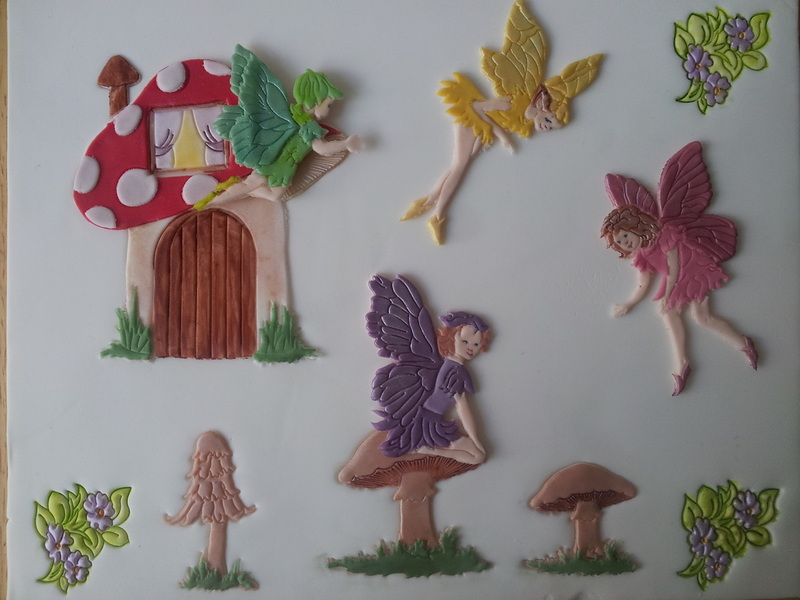 On this course will you make this delightful plaque of colourful fairies and toadstools - a must for any little girl's cake! You will cover a board with sugarpaste and then, using the Patchwork Cutters Fairies set, be shown how to emboss the design on the plaque, create the fairies and toadstools using both applique and decoupage techniques., You will also be shown how to paint the embossed flowers using a mix of colour dust and isopropyl alcohol. 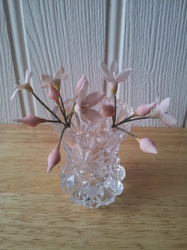 This course is a useful introduction to sugar flowers. veiners. The plaques are made from Mexican paste and will be provided. On this course you will learn how to make realistic looking ivy, together with berries and winter jasmine flowers. Because of their deep colour, berries look particularly good mixed in a winter or autumn display of flowers and foliage. Ivy comes in many varieties and colours – including variegated - and can be mixed with various flowers to give definition and structure to a display. Jasmine is a very pretty white flower with pinkish buds, it complements a number of other flowers in displays and is useful as a “filler” flower. You will learn all the necessary techniques required, including wiring, taping, colouring and glazing, so that you go home with a beautiful display. This course provides a useful introduction to cake decorating. You will be shown various useful techniques in order to produce a professional looking cake. You will be shown how to split a Madeira cake and fill with buttercream, how to professionally cover a Madeira cake and cake board with sugar paste using smoothers, how to make and colour a decorative wired burst cake topper using flower paste, how to make and colour butterflies using flower paste and how to colour modelling paste and make decorative bows. Please note that you will need to bring your own 7" Madeira cake. On this course you will learn all the skills necessary to make Arum lilies, Stargazer lilies and/or Tiger lies. Lilies are large dramatic flowers and therefore few are needed to make an impressive display on cakes. Arum lilies come in many different colours - from the palest shades (white) to the darkest of shades (aubergine) and can be mixed with a variety of other flowers and foliage. Stargazer lilies are most commonly found with the centre of the petals appearing in shades of pink. Tiger lilies come in many vibrant shades – e.g. deep red, deep orange and deep yellow shades. This course is suitable for complete beginners in sugar modelling. Come along and make some 3-D teddies in a variety of colours. You will be shown how to make the teddies in two sizes - the larger teddy stands approximately 4” high and the smaller one approximately 3” high. Use the two sizes to create a family (i.e. mum, dad and baby teddies). In addition, you will make some 2-D teddies which are useful as side decorations on cakes. 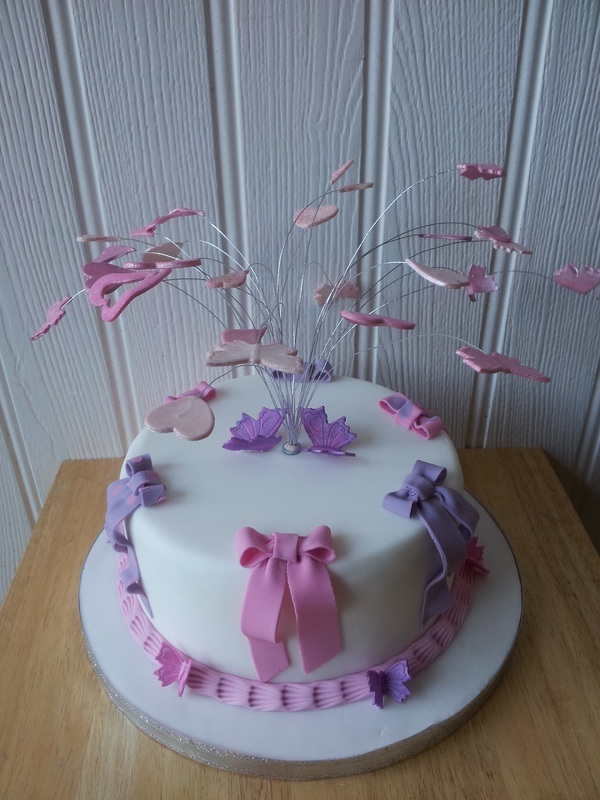 Having mastered basic skills on covering a cake (Basic sugar paste techniques course) come along and discover how to stack and decorate a two tier cake. You will need to bring TWO Madeira cakes in the shape of your choice but please note that cakes should be 3" difference in size – e.g. 5" and 8". Roses are probably the most common flower requested for displaying on cakes. On this course you will be shown how to make realistic looking roses and buds using just one complete cutter for the petals (no wiring!) and a calyx cutter. You will learn how to make a rose using 3 shades of flower paste (and be shown how to successfully colour the paste), as well as how to colour a dried rose using petal dust. The roses will be made on cocktail sticks which allows for them to be inserted directly into a cake. 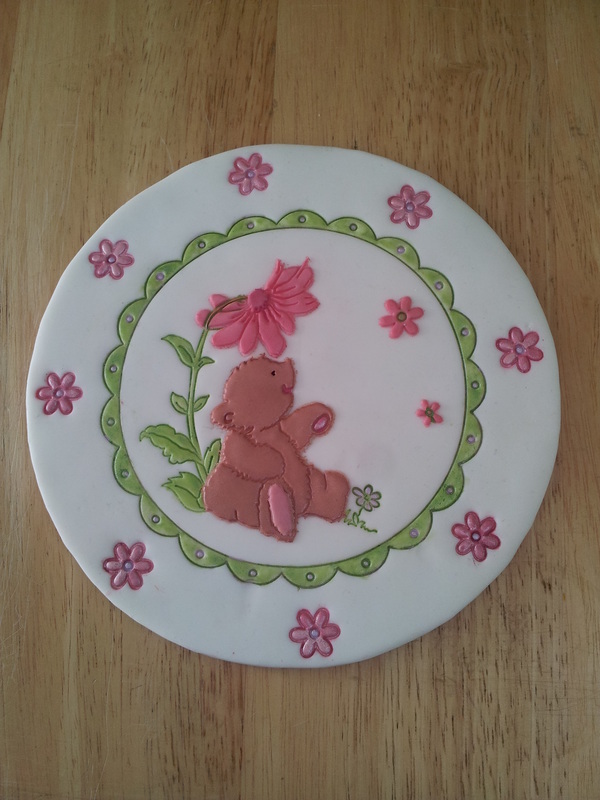 On this course you will learn how to make a delightful plaque displaying a teddy sitting under a flower – a lovely design for any child’s cake. 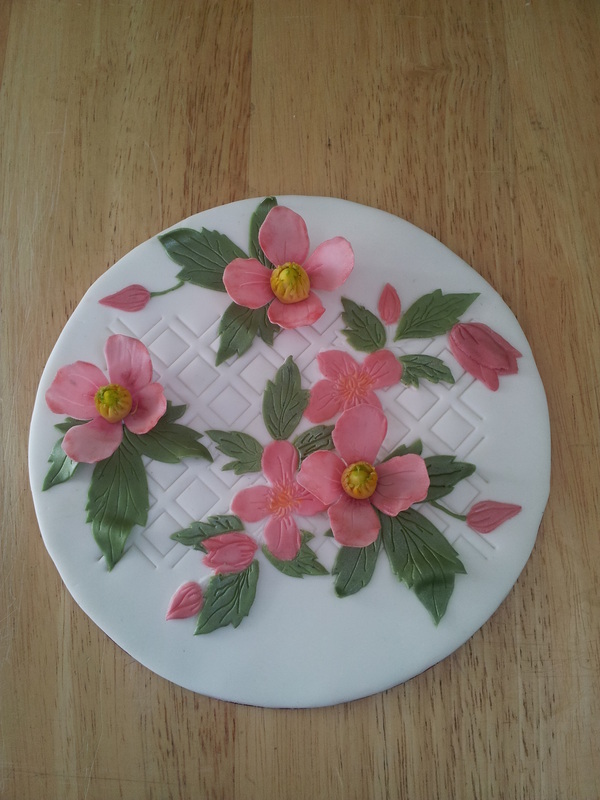 You will learn how to cover a board with sugar paste which will then be used as plaque. You will emboss the teddy design onto the plaque and be shown how to create the Teddy and flower using the applique technique in order. You will also be shown how to colour some of the embossed design (e.g. 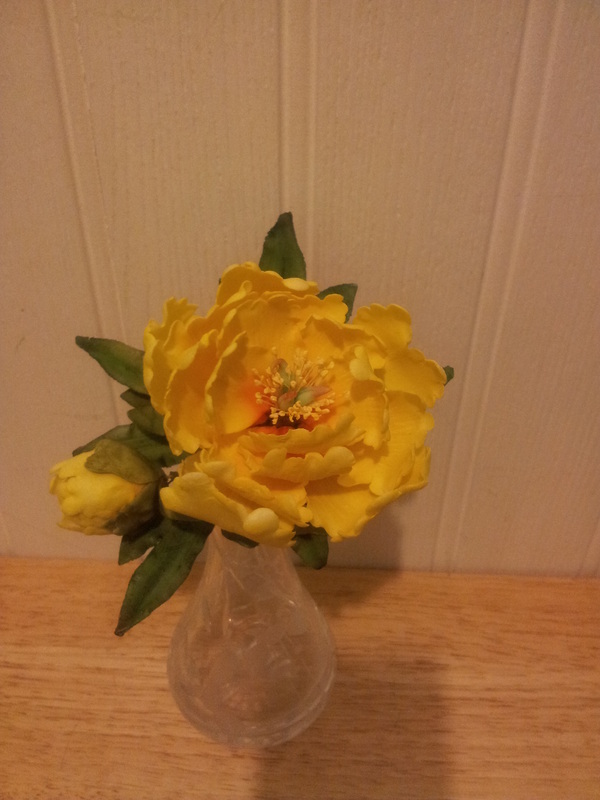 the flower stem and outside decoration) using petal dust and isopropyl alcohol. On this course you will make carnations in the colour of your choice and sprigs of lily of the valley. you will also be shown how to tape the flowers into beautiful displays. These two flowers complement each other perfectly as well as looking attractive with other flowers and foliage - lily of the valley looks striking as the main flower combined with ivy. On this course you will make an impressive teddy to use as a cake topper, using the Patchwork Cutters "make a teddy set". The teddy is large sitting at 5.5" high and 5" deep. You will learn the necessary modelling techniques to make the teddy in the colour of your choice. On his course you will be shown two methods of making roses in order to be make realistic displays of wired roses and rosebuds. They may be made in the colour of your choice. 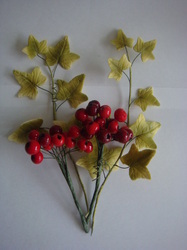 You will also be shown how to make and colour rose leaves. You will learn all the necessary techniques, including colouring and taping so that you go home with a beautiful display. On this demo you will be shown several techniques using Patchwork Cutters. You will first see how to successfully cover a board which will be used as a plaque. You will then be shown how to emboss a design all over the board (a useful technique to use on cakes - around the sides, on the top or all over). Next you will be shown how to create the two large swans, using the decoupage technique for their wings, and be shown how to create the smaller swans and river reeds. A romantic design to be used for romantic occasions such as engagement. On this course you will learn how to make a beautiful display of clematis creeping along a trellis using Patchwork Cutters. You will be shown how to cover a board with sugarpaste and how to emboss the trellis design which will be used as a plaque for your design. You will then create the background design of the clematis and, using the applique technique, create the flowers and leaves. You will also make and colour individual clematis flowers and leaves for adhering to the display. On this course you will learn all the necessary skills in order to make chrysanthemums in three tonal shades of flower paste (in the colour of your choice). You will also make chrysanthemum leaves and be shown how to tape the flowers and leaves to make a beautiful spray to take home. On this demo you will be shown several techniques using Patchwork Cutters. You will first see how to successfully cover a board which will be used as a plaque. 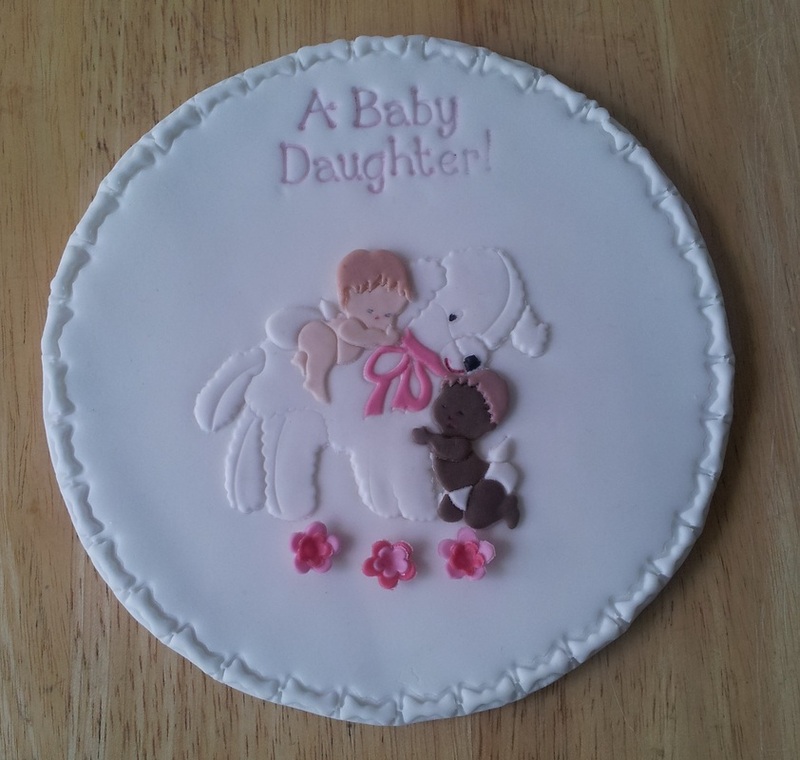 You will be shown how to emboss a design all over the board (a useful technique to use on cakes – e.g. around the sides, on the top or all over). 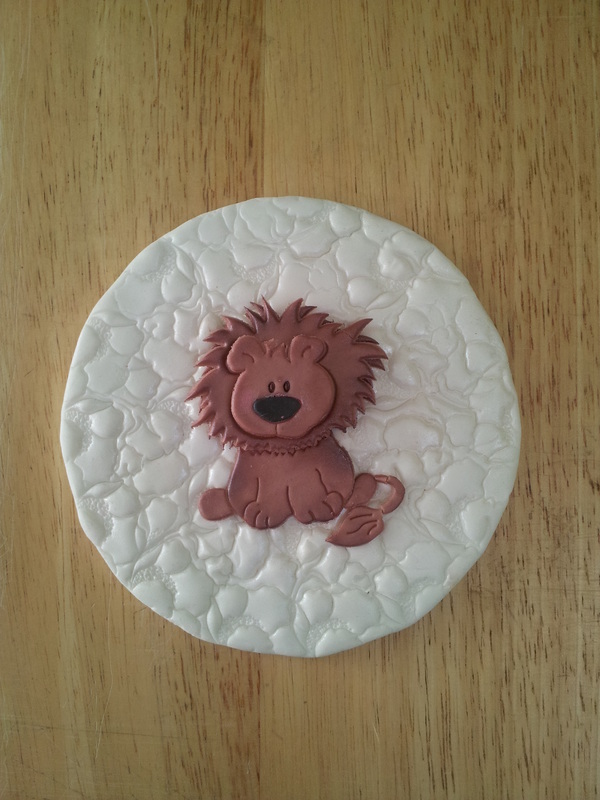 You will then be shown how to create a lion to sit in the middle of the plaque using the decoupage technique. A great design for a baby’s first birthday, a toddler’s birthday or a Christening cake. On this course you will be shown numerous techniques in order to create this beautiful blackberry spray. This spray looks great on a cake when trying to create a wild theme. You will be shown how to make the flower buds, flowers and berries and be shown how to make the component parts into a beautiful spray containing ripe, semi ripe and unripe blackberries as well as buds, flowers and leaves. On this course you will learn all the necessary skills in order to make a variety of orchids. The orchids may be made in the colour of your choice. A display of orchids looks dramatic and exotic on a cake. 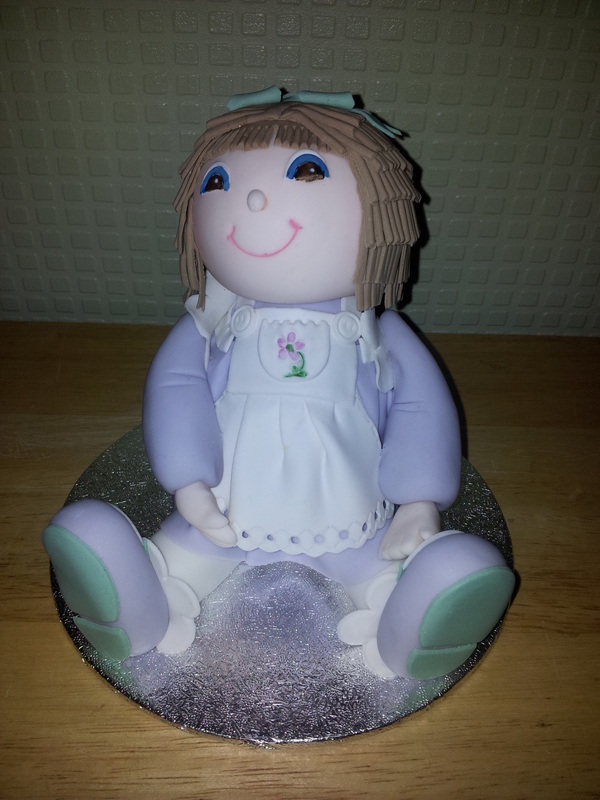 On this course you will make this impressive ragdoll cake topper using the Patchwork Cutters "make a ragdoll" set. The doll is fairly large sitting at 5.5" high. You will learn the necessary modelling techniques to make the ragdoll in the colour of your choice. On this course you will learn all the skills necessary (colouring, wiring and taping) in order to make a peony flower, a bud and a selection of leaves. You will then bind them together to produce a beautiful display. Peonies are large dramatic flowers and few are needed to make a dramatic display on a cake. Detailed instructions will be provided for you to take home. Come along and make a seasonal flower display for your Christmas cake. 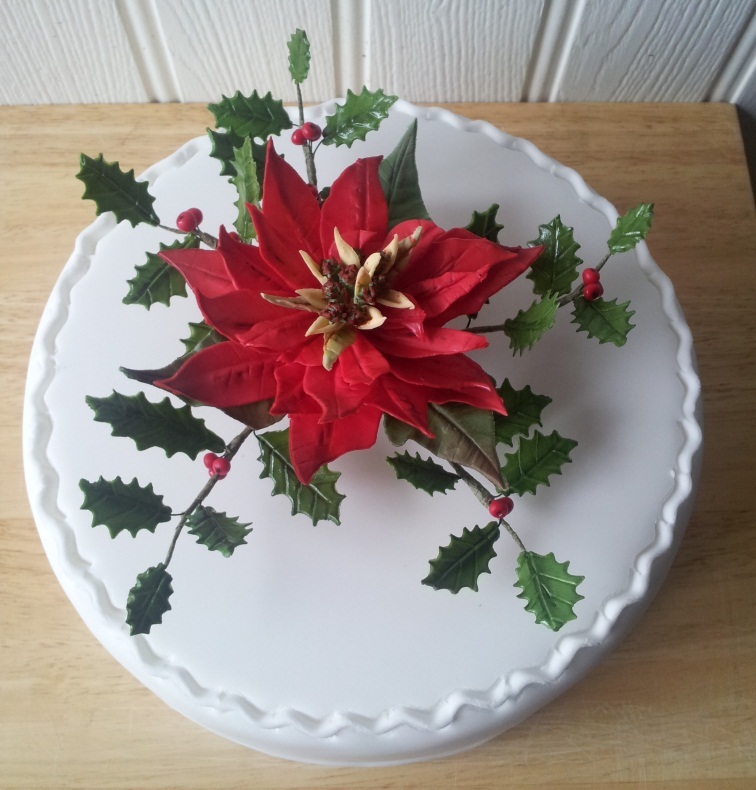 On this course you will cover all the necessary techniques including wired petals, colouring, glazing and taping, in order to make a wired display of a poinsettia with holly leaves and berries. You will learn all the skills necessary to make this impressive large Santa cake topper. 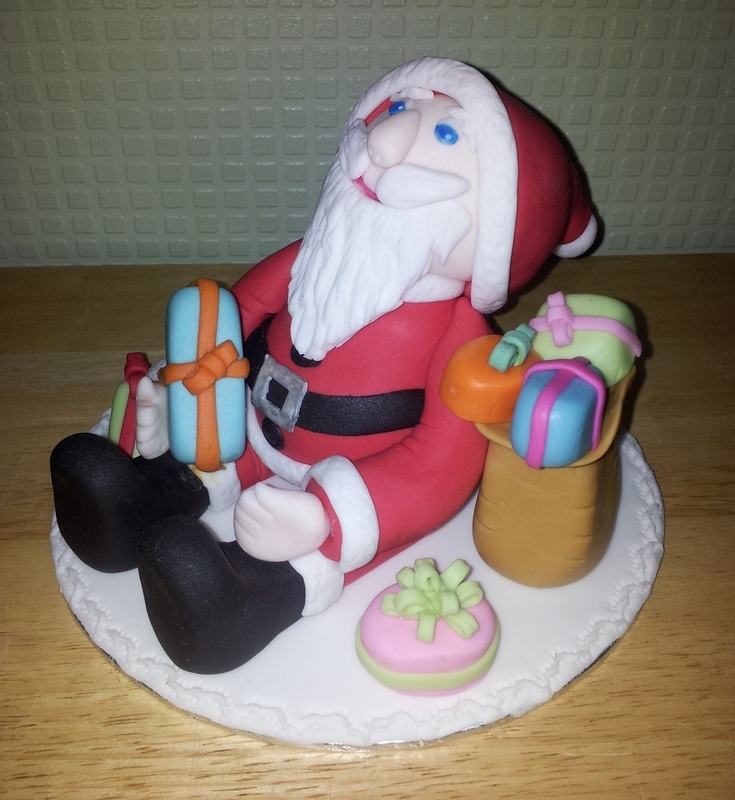 Sitting at approximately 5.5” high and 6” deep, this large Santa, together with his sack of presents makes a dramatic cake topper.